Russia is gaining a strong foothold in the Middle East. Coming to the aid of Bashar Al-Assad on the pretext of eliminating the threat posed by ISIS, Russia has moved dozens of airplanes, gunships, tanks, as well as hundreds of operational personnel into Syria. Mr. Putin and his military have warned the U.S. and the French to stay out of the way of Russian fighter-bombers as they target any and all groups opposed to their barbaric ally, Assad, including both ISIS and the so-called moderate Free-Syrian army (half-heartedly supported by the U.S.). The story occupies considerable air time on mainline media. But the backstory is much more strategic, although no one will hear it discussed in much depth on FOX, CNN, or any other mainline media outlet. No one wants to alarm the American people to the point where the nation calls for a meaningful response to Russian aggression from this administration. On the surface, Russia worked cooperatively with Western states to conclude the pact with Iran. Unlike other Western nations that celebrate the agreement, Russia like Iran, emerged from the negotiation in a much stronger position. Now Russia eagerly sells military weapons to Iran, (including the impressive anti-aircraft missile system, the S-400) and shows itself a friend to the Shia in Iran, Iraq, and Syria. As Russia exercises its military muscle, the rest of the region has awakened to the fact that the U.S. is not the essential player it once was. Mr. Putin will now be calling the shots. The request this week from Shite Iraqi leadership asking Russia to attack ISIS, demonstrates that fact plainly enough. 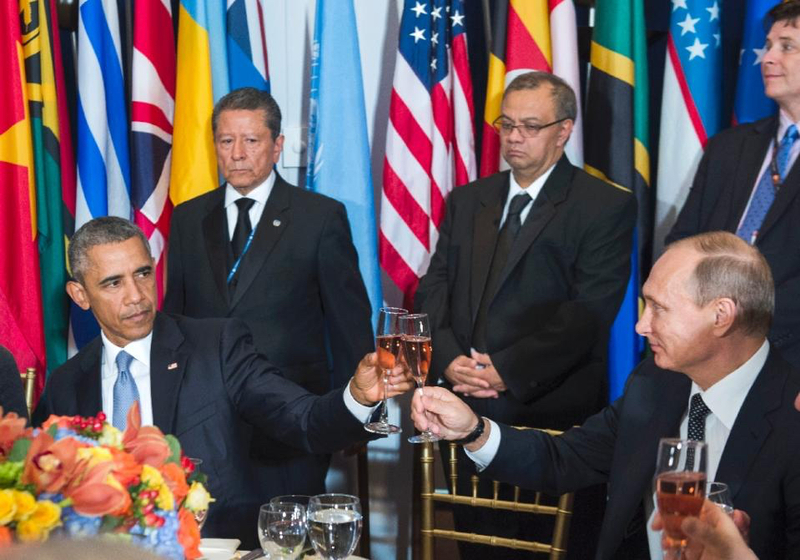 Symbolically, all that President Obama could muster when meeting with Putin at the U.N. last week was a frown as he toasted Putin. 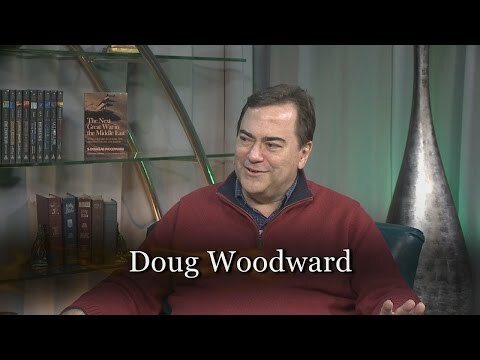 Because of the significant events of this past month, it is time once again for students of Bible prophecy to reflect on the “latter days'” Battle of Gog and Magog and to revive the conventional view that Russia, not Turkey or Saudi Arabia, will constitute the leader coordinating the Islamic pack described in Ezekiel 38-39. 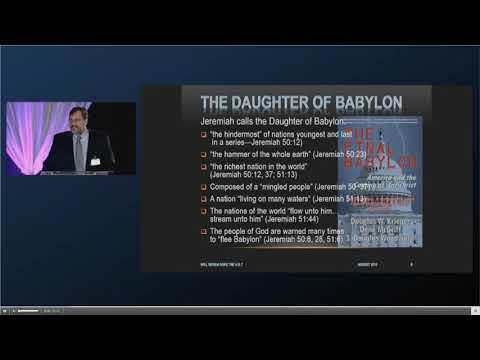 Is the Daughter of Babylon Included in Ezekiel’s Prophecy of Gog and Magog? I will defer, however, the somewhat academic task to another time–that of listing all the parties and their ancient names and geographical locations cited in Ezekiel’s description of God and Magog and its confederation (I will take that up when writing Part 2 of the article “Is Gog Just a Turk?” published here and in Prophecy Watchers Magazine a few days ago). 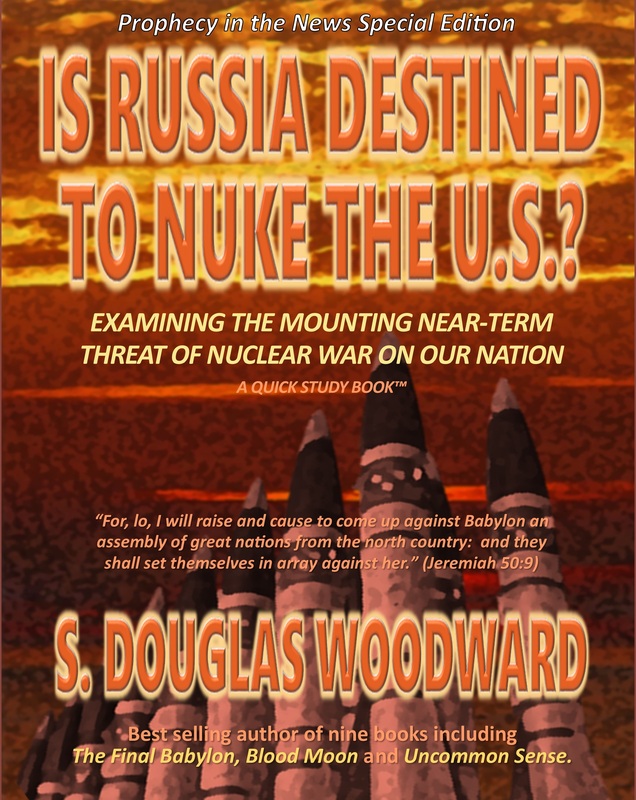 Here I wish to introduce a different subject but one that has been discussed in my book, Is Russia Destined to Attack the U.S.? That subject entails the presence of the daughter of Babylon, which I believe lies implicit within Ezekiel 38-39. Moreover, I argue that this passage pertains not just to the controversial view that Russia is Gog, but that the United States is the “land of unwalled villages”. It has been my contention (and many others with me, including my co-authors of The Final Babylon, Douglas W. Krieger and Dene McGriff), that the U.S. constitutes the fulfillment of the daughter of Babylon (see Jeremiah 50-51, Isaiah 47, Zechariah 2, and Psalm 137). Given the vast importance of the battle of Gog and Magog in the last days scenario, it is not unreasonable to suggest that there are a number of important aspects of prophecy encoded biblically in Ezekiel’s passage that connect its prophecies to others in the Bible dealing with the identical, fateful times of the last days. As the Lord allows, I will delve into other matters in the future that can be unearthed from digging into Ezekiel 38-39. At the outset, we plainly see that Ezekiel 38-39 provides an intensive description of Gog’s attack plan upon Israel. In the first eight verses of chapter 38, Ezekiel tells us that Gog should assemble or “convoke” (Strong’s H6950,kä·hal) the armies surrounding Israel. It will kahal or gather together (the same word used when Moses gathered together the assembly of Israel) numerous nations to come against the land of Israel. We are told by Ezekiel that this land will have been restored from a waste, from violence, and will provide a safe habitation for the people of God. However, at this point it is crucial to ask, “Exactly what does it mean that Israel shall dwell safely? ” The word safely (Strong’s H983) is the word (transliterated) betach (beh’takh). The word connotes a sense of ease, being carefree, having no fear of being harmed. It is used 42 times in the KJV of the Old Testament, 26 of which are translated safely or safety. Jeremiah talks of the regathering of Israel in the latter days as well and uses very similar language to Ezekiel. “Behold, I will gather them out of all countries, whither I have driven them in mine anger, and in my fury, and in great wrath; and I will bring them again unto this place, and I will cause them to dwell safely.” (Jeremiah 32:37) Jeremiah assures Israel that the Lord intends only good for them: “Yea, I will rejoice over them to do them good, and I will plant them in this land assuredly with my whole heart and with my whole soul.” (Jeremiah 32:41) It is in this passage that we see the covenantal promise explicitly stated once more: “And they shall be my people, and I will be their God.” (verse 38). No mention is made that Israel should continue to fear attack, for betach promises deliverance from all the matters that have threatened the Jewish people through the ages. My friend and true scholar Gary Stearman recently indicated on his Prophecy Watchers television program (October 5, 2015), that the word in this specific verse infers a “false sense of security”–a sense of safety based upon factors such as reliance upon the United States for its protection or confidence based upon the many prior successful operations of the Israel Defense Force (IDF). Gary cites noted Hebraic-Christian scholars including the likes of noted prophecy expert Dr. Arnold Fruchtenbaum who, like Gary, contends this particular translation to be its true meaning. The conventional and respected view, which Gary holds, is that the land of unwalled villages is Israel. I might add, as Gary points out rather colorfully, that Prime Minister Netanyahu used the two words Shalom Betach (peace and safety) as his campaign slogan in his recent electoral campaign! Given this interpretation, Gary and Dr. Fruchtenbaum assert that the use of “unwalled villages” should in this case not be taken literally –but taken figuratively. Concurring with his interpretation (in part), the old standard, Vines Bible Dictionary, suggests it may indeed, on occasion, convey a sense of overconfidence. We see this in Isaiah 47:8, where translators express the Prophet’s rebuke against about the daughter of Babylon with these words, “Therefore hear now this, thou that art given to pleasures, that dwellest carelessly (betach) that sayest in thine heart, ‘I am, and none else beside me; I shall not sit as a widow, neither shall I know the loss of children'”. Clearly, the context demonstrates that betach, in this instance, conveys a sense of braggadocio or overconfidence. But does this specific passage, Ezekiel 38:10-13 (specifically, verse 11), provide the same context as Isaiah 47? Are we talking about Israel in this passage in Ezekiel, or are we encountering a prophecy pertaining to some other people (s) or land (s) as we are in Isaiah 47? It should be noted that the King James Version translators back in the seventeenth century did translate the word betach as “carelessly” in several passages just as we cited in Isaiah 47:8. But they did not do so in Ezekiel 38:11. Certainly the translators knew the Hebrew word betach could mean overconfidence or a false sense of security, but in the instance of Ezekiel 38:11, they chose not to translate it this way. Their translation of betach was “dwell safely”. Was their translation correct or incorrect? I argue that they got it wrong. That as Stearman and Fruchtenbaum contend, betach should have been translated “carelessly” implying a false sense of security. However, as we are about to see, this actually is the key to understanding that Israel is not the subject of this passage. And that sets my analysis apart from the conventional view, for better or for worse. However, when looking at the passage in Ezekiel 38, there are reasons to distinguish between “dwelling safely” and “dwelling overconfidently” and to ascribe to that distinction an intentional differentiation in the subject of the prophet’s comments. In other words, not all of the predictions about Gog’s plans are directed toward Israel. To prove this case, it requires we take into account all the scriptures in the Old Testament where the word betach is used. This is the key to decoding the meaning of Ezekiel 38:10-13. I could go on to cite 33 other instances where betach simply means “safely” or “safety”. There are only a handful of verses where it means “carelessly”, implying a false sense of security. But looking at those verses that are “outliers” comprises the key to understanding why Ezekiel 38:11 is not referencing Israel. It is highly improbable that Ezekiel 38:11 references Israel dwelling carelessly or overconfidently. If it did, it would be the only place in scripture that uses the word betach pejoratively when applied to Israel. If in Ezekiel 38:11 betach is being used pejoratively (and I believe it is so used although the KJV has in this instance translated it incorrectly), then it must not reference Israel. In all cases where the word betach is translated implying a “false sense of security”, it refers to gentiles or the enemies of God who are overconfident and careless. Thus, the argument from the whole of Old Testament scripture seems strong and clear: As it relates to who is dwelling safely, it is either Israel–and Israel must be in fact be secure in the promise of God (that they will dwell safely)–or it is not Israel because the people to whom Ezekiel makes his prediction are overconfident and arrogant. Therefore, Ezekiel 38:11 does not refer to Israel. Consequently, we do not need to suppose that the day of the Lord is held up because Israel is NOT living in peace and security. The scripture does not convey that it will be in that paradisiacal state when Gog amasses its armies to attack it. Again, to reiterate, the typical understanding of verse 11 is that it refers to Israel when it uses the words “shall dwell safely.” But Israel isn’t the object of this prediction. Ezekiel adds some significant metaphors to amplify his condemnation of this people that is the subject of his castigation: it is a land of unwalled villages, its people dwell without walls around their city, and these cities employ neither bars nor gates to keep out invaders. They dwell carelessly because they think they are invincible. The many nations enumerated by Ezekiel such as Persia, Libya, Put, Meshech, Tubal, etc., come like a storm with Gog to “cover the land”. Gog assembles a confederation that would be judged as “overkill” when opposing the tiny land of Israel. So, since the usage of betach in other verses asserts the promise of peace and safety to Israel, why would verse 11 be a pejorative (a criticism) against Israel, and no longer a promise? What is it that makes Ezekiel 38:11 different from the other verses where betach is the fulfillment of God’s covenant with Israel? Is it because the verse mentions unwalled villages (which Jerusalem and Judea is not, possessing a 417-mile wall to protect its people from Palestinian terrorists)? No, Israel is neither overconfident nor is it secure at this time. It is not a land of unwalled villages. Don’t think that using the phrase “gates and bars” (or “neither gates nor bars”) changes the meaning. This phrase is used commonly in the KJV of the Old Testament to underscore that a village is either walled and protected, or unwalled and unprotected (for instance, see Deuteronomy 3:5, I Samuel 23:7, 2 Chronicles 8:5, 14:7, Jeremiah 49:31 among many others). It is a common catchphrase used in the Hebrew Scriptures much like “signs and wonders” which is used throughout both the Old Testament and the New. The people referenced in verse 11 believe they live securely and do so overconfidently (as in Isaiah 47:8), living in unwalled villages without gates or bars. Thus, the word betach in Ezekiel 38:11, should have been translated “carelessly”, if it was as has been shown above, it would clearly indicate that the prophet is NOT condemning Israel. The inference of criticism in verse 11 references a different land altogether. Therefore, could the “land of unwalled villages” be America? Notice that Isaiah’s use of betach is a pejorative–the use of the word betach is almost cynical when saying to the effect, “You think you dwell safely, but you have a false sense of security”. To cite this instance once again for the reader’s convenience: “Therefore hear now this, thou that art given to pleasures, that dwellest carelessly, (betach) that sayest in thine heart, ‘I am, and none else beside me; I shall not sit as a widow, neither shall I know the loss of children'”. (Isaiah 47:8) The daughter of Babylon constitutes “overconfidence incarnate.” This clearly seems to be an essential element of its undoing as other passages mentioned above plainly express. It is an arrogant nation. Jeremiah says that the daughter of Babylon is an arrogant land twice saying in Jeremiah 50:31-32, “O thou most proud”. While Israel has certainly sinned against its God and spoke arrogantly against him as the prophets lament so many times, in Ezekiel 38-39 there are no statements that castigate Israel for being “overconfident.” Israel is ripe and ready to receive the fact that Jehovah is its God and its salvation. Indeed, another most striking element of the verse consists in the manner in which the original King James Version translated verse 10. Compare the words and the translation of the KJV with that of the New American Standard Bible (note the links to the various words aligned by the providers of the Blue Letter Bible with the English translation of those Hebrew words). full 8 always (4x), whole (4x), alway (4x), misc (44x). (When one argues that the day of the Lord must be a 24-hour period, which many do, the extensive uses of day argues quite to the contrary–the period many be held to consist of a wide-variety of durations). In contrast, hayah, is very specific. It means an emphatic occurrence such as “it shall surely happen” or “it will most certainly come to pass”. Thus, the translation that virtually all versions employ conveys something to the effect that “on that day” or “at that time” it will “come to pass”. But it should be emphatically stated as “on that day, it will most certainly come to pass, that…” For our purposes here, the point is that day is not necessarily a single day, but is likely a compressed period of time–perhaps a matter of weeks or several months. “At the same time” could mean within the same 24-hour period, but it might also mean “during this same period of time.” However, its emphatic usage suggests the Prophet wanted to stress how two events were tied together and occurred within a short span of time. What is different about the KJV translation, which is generally missed perhaps because the other translations do not include the word, is the insertion of the small adverb also. We know that also is used to link a series of items or events. Also is not necessary unless it is specifying something distinct from what the speaker was previously discussing. To express this more clearly, one could use these words, “In addition, it shall also be the case…” meaning that in addition to what I just told you, let me tell you something else which is not the same thing as what I just told you.” In this instance, the KJV suggests that what is about to be shared in the verses that follow amounts to something different than what has been said previously. Perhaps we could consider this prophecy in Ezekiel 38:10-13 to be a parenthetical comment. It is an “aside” as we now say. However, we term it, the inference is that we are not dealing in these verses with the land of Israel. We are dealing with a different land or several other lands. For at the same time that Gog is thinking about attacking Israel he also has yet another evil thought. He will go up against “the land of unwalled villages” where those that dwell securely do so carelessly, overconfidently. It is most intriguing that the translators of the King James Bible, when examining this passage, judged Gog to be about two things, not just one. While Gog is planning to come up against Israel along with what the consensus agrees comprise the Islamic hordes, Gog thinks up another evil action. “At the same time, you Gog will also think of attacking a land of unwalled villages.” I contend this use of “also” was not accidental or careless (no pun intended). So who is this land? What is going on there? I will go up to the land of unwalled villages; I will go to them that are at rest, that dwell safely, all of them dwelling without walls, and having neither bars nor gates, To take a spoil, and to take a prey; to turn thine hand upon the desolate places that are now inhabited, and upon the people that are gathered out of the nations, which have gotten cattle and goods, that dwell in the midst of the land. What we see are contrasting peoples. One is a land promised safety but has not yet achieved it and will thus be threatened by Gog–so much so that when it is delivered, only God can be given credit for its salvation. This land is Israel. God will be glorified by Israel’s deliverance (Ezekiel 38:23, 39:22, 27). The other land is not promised safety at all, but judgment. And it is stunned when it is attacked. We can see this by considering its comments upon being attacked in Ezekiel 38:13. Indeed, verse 13 buttresses my case for these peoples being chiefly the daughter of Babylon. The standard view is that in this verse we read about Sheba and Dedan, the Merchants of Tarshish, and its “young lions.” Almost every author and scholar from Hal Lindsey and John Walvoord in 1970, to Chuck Missler and Bill Salus today, propose these peoples are easy to identify. Sheba and Dedan refer to those that live on the Arabian peninsula, the Merchants of Tarshish are Europeans (most likely England, but also Spain and Portugal), and the young lions are the “offspring”–the colonies–of these European nations which include the countries of the Americas, but most importantly, the United States. Those that have written about this verse interpret the meaning of the words Ezekiel uses to suggest that these peoples protest about the invasion of Gog as it comes against Israel, but do nothing. As author and teacher Ron Rhodes says in his book, Northern Storm Rising, the verse smacks of a “lame protest”. But it is my contention that there is much more to the statement in verse 13 than just a protest, an expressed astonishment that Gog would have the nerve to attack Israel. If America were the subject of the attack, we would ask ourselves “why are we being attacked Gog?” We would wonder (rather quickly I would suppose as there would be little time to conjecture), why Gog’s missiles are heading toward us, “Are you planning to take away our cattle and goods, our silver and gold, to take us away as captives? Gog, what’s up?” The subjects in verse 13 are not as concerned with Israel being attacked as much as they are concerned that they are being attacked. But does this square with other verses in Ezekiel 38-39? Absolutely. They that shall dwell carelessly (betach ) are those that dwell in the isles: “And I will send a fire on Magog, and among them that dwell carelessly in the isles: and they shall know that I am the LORD.” (Ezekiel 39:6) The land of Gog, Magog, will be the recipient of God’s judgment. But Magog is not the only land targeted by judgment. Those that “dwell in the isles” are subjected to fire as well. Who are these people? The scripture paints a picture of these “island” people typically as merchants, as Canaanites (Canaan means merchant), as the people of the Canaanite (Phoenician) city of Tyre and Sidon (aka Zidon), and the merchants of Tarshish. We already encountered the merchants of Tarshish in Ezekiel 38:13. But the reference here to this same people seems quite clear when one considers the use of the little Hebrew word for isle, the small word iy (pronounced “e”, Strong’s H339). The word iy, appears 36 times in the Old Testament–30 times it is translated as isle. Its usage, however, seems idiomatic for Old Testament writers connoting those lands from “far the center of the world” which was, of course, Jerusalem. A good example of its usage is seen in Isaiah 23. And guess who is the subject of this passage? The Minoan Civilization, contemporary to Ancient Egypt, 2,500 years before Christ. In the one instance where the translators of the KJV employ the word “country” instead of isle, we see the same people once again: “Because of the day that cometh to spoil all the Philistines, and to cut off from Tyrus and Zidon every helper that remaineth: for the LORD will spoil the Philistines, the remnant of the country H339 of Caphtor.” (Jeremiah 47:4)  The Old Testament tells us at the very beginning that the sons of Japheth will inhabit the isles (the countries far away). This testimony is supplied in Genesis 10:2-5. “By these were the isles of the Gentiles divided in their lands; every one after his tongue, after their families, in their nations.” (Genesis 10:5) It should be apparent that the Bible does not often use the term iy explicitly to convey an “island” although it can mean that. Instead, the biblical meaning relates to lands that are distant, far from the shores of Israel. There are many cases, as the instances above demonstrate, in which the isles relate to Tyre, Sidon, and Tarshish. Yet another reference is in Jeremiah 25:22: “And all the kings of Tyrus, and all the kings of Zidon, and the kings of the isles which are beyond the sea.“ As I argue with my co-authors in The Final Babylon, these reference are to the lands of the New World, lands discovered and exploited by the ancient powers like the Phoenicians dating at least as far back as Solomon (1000 BC) and possibly to the time of the Minoans (2000 BC). When Ezekiel declares that God will send fire on Magog and those that dwell carelessly in the isles, he is most likely conveying that the lands explored and settled by the Sidonians (aka the Canaanites or Phoenicians), will be judged with fire as well. For these reasons, I contend that America is the daughter of Babylon and is encoded in Ezekiel 38-39. Even Sir Halford MacKender in his pivotal strategy known as the Heartland Theory (first published for the Geographic Society of England in 1904, and which serves as the basis for geopolitical theory today–see Zbigniew Brzezinski–The Grand Chessboard), considers the “heartland” to be the contiguous continents of Europe and Asia (nowadays called Eurasia), with the rest of the world as the “islands” that are disadvantaged by being outside the world’s core landmass. MacKender’s theory laid the groundwork for understanding how those who lie beyond the Heartland (like England and America), must play what the British called The Great Game in the nineteenth century, predominantly with Russia (as the Ottoman Empire of the Turks had crumbled). The Crimean War (1853-56), where Britain and France allied themselves with the Turks against Russia, was the last vestige of life for the Old Ottoman Empire. World War I ended what was already a decimated and tired kingdom. Thereafter, only Russia and China would contend with England and be future rivals to the Anglo-American world of the twentieth (and the twenty-first century). Consequently, to understand the current situation in the Middle East, one must understand the notion of “heartland” and the “isles” that exist outside Eurasia, and how the geopolitical game is to be played. Arguably, the current U.S. administration does not fully grasp MacKender and does not play the game great which much skill. In conclusion, the standard bearers of biblical prophecy from Hal Lindsey and Tim LaHaye in the 1970s to Chuck Missler and Bill Salus today, uniformly agree that the reference in Ezekiel 39 to those that “dwell carelessly in the isles” likely means the Americas. My conviction is that not only is their informed speculation right, there remains almost no doubt that this is so. Whether we are reading the Bible or evaluating current world geopolitics, we should draw the same conclusion. 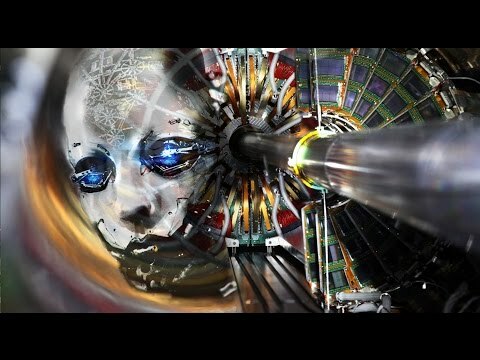 When we dig deeply into the prophetic mindset of the prophets like Isaiah, Jeremiah, Zechariah, and especially in Ezekiel, we understand that the world in the last days will consist of the lands and people of (1) Gog from Magog supported by the nations surrounding Israel, (2) those that dwell in “isles” far away across the seas, and (3) Israel. And in the final analysis, Israel will stand alone with only its God, Jehovah, to protect it in its concluding days before the coming of its Messiah, the Lord Jesus Christ. 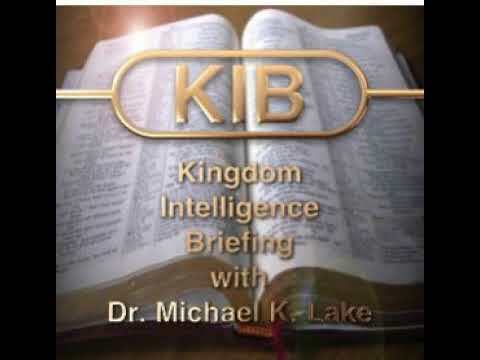 The daughter of Babylon will be destroyed by Gog, Gog will be destroyed by God, and then only the little horn of Daniel, the Antichrist, will remain to gather up what’s left of the world of the pieces to bring these resources, weapons, and soldiers to bear against tiny Israel, God’s people. Returning to the context of what’s happening in Syria, which is where we began this paper, we must point out that the U.S. appears destined to fail there while Russia appears destined to install itself as the prime mover and shaker not only in Syria but in all the lands just to the north of Israel, from whence the prophets of the Bible uniformly assert the powers seeking to destroy Israel always originate. Gog will be no different. The prime mission in the region is to eliminate ISIS, but for that very purpose, the U.S. and Russia have adopted different approaches. 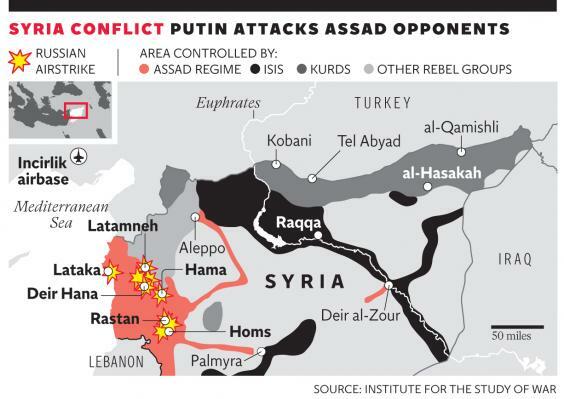 The U.S. believes that defeating ISIS will not be possible without removing Assad, while Russia sees Assad as a heroic fighter against terrorism, as recently characterized by Putin in a 90-minute meeting with Obama. As Ezekiel prophesies, this failure in geopolitical strategy will have disastrous consequences for the nation whom the Bible calls the Daughter of Babylon. If you feel led, please donate to my writing ministry. I am seeking to do much more writing via timely articles than through my books to meet the demand of so many vital “breaking events” in the world right now (usually available in less than a week of when I conceive them, instead of six months for a book). The Donate Button is located on the right column and will take you to PayPal where you can donate via credit card or your PayPal account. Also please subscribe to my blog to get an email copy sent out automatically to you immediately as I publish them online at faith-happens.com. Mark Langfor, October 5, 2015, Israel Nation News. For link, click here. Caphtor seems likely to be referencing crete or cyprus. 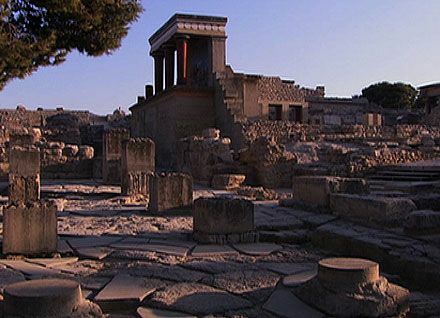 It is generally thought that the Philistines originated from the Minoans on the island of Crete, whose ancient civilization dates back to 3,000 B.C. was destroyed when a massive volcanic explosion occurred in 1627 B.C. on the nearby island of Santorini (the volcano Thera–whose volcanic ash has been radiocarbon dated to this time and piled up over 21 meters high in lands east of the volcano). There was only a remnant that survived this volcanic eruption estimated to have been ten times more powerful than Krakatoa event in 1869. 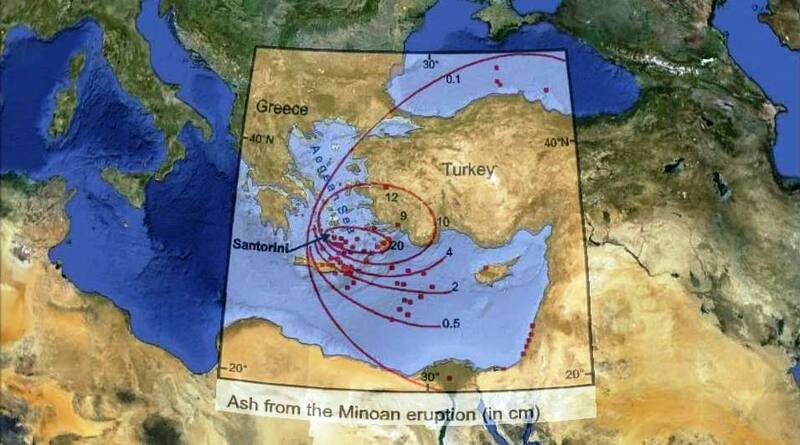 Ash from the Minoan Eruption of 1627 B.C. Taimoor Kahn, ValueWalk, October 9, 2015. For link, click here.